should-be-FUN-dammit convictions. Over the years, this fervor has resulted in an onstage wedding proposal betwixt two fans (SXSW ‘02), a riot (Edinburgh ‘03), and a thousand and one lost nights of sweaty, happy reverie. Sadly, there’s always been the undercurrent of grousing, as good as the studio albums are, that, well, it’s not like BEING there. Well, now it is. On Waco Express, you can practically feel the heat from the stage, smell the smoke on your clothes, taste the beery taste of beer and let your ears bask in the un-tempered wall of sound. When the first Wacos CD hit the streets in 1995, punk AND country were lying torpid, shaming their respective populist histories. Fifteen years later, the problem has gotten nothing but worse, with one shilling for cruise lines and luxury cars and the other blathering on with a jingoistic fervor not seen since Remember the Maine! Quite frankly, we need the Wacos now more than ever. 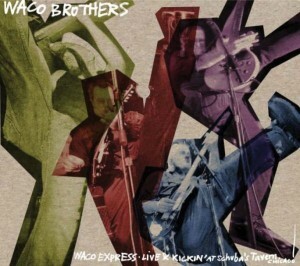 Four songs into their uproarious Waco Express: Live & Kickin’ at Schubas Tavern (Bloodshot), the Waco Brothers combine pure blues, honky-tonk country, and stand-up comedy. They’re a so-called mutant country band composed mostly of U.K. expatriates–guitarist Jon Langford, mandolinist Tracey Dear, bassist Alan Doughty, drummer Steve Goulding–plus steel guitarist Mark Durante and guitarist Dean Schlabowske, both originally from Milwaukee. With Waco Express it doesn’t matter whether you get out much or not; you’re right there in Schubas Tavern as if you’re there five nights a week. The musicians have brought their beers onstage, they’re pushing and insulting each other, greeting friends in the crowd, announcing themselves with “Waco Express,” which inevitably comes off as a version of “Hey, hey, we’re the Monkees.” They bash their way through three songs. And then something breaks–a glass, the space-time continuum, lightning striking through the roof, it doesn’t matter. Everything is different. It’s one of those moments that can happen only in a small club or a hall where the crowd is on its feet because there’s nowhere to sit down. It’s a sense of event: Something is about to happen. No, something has already happened–the emotional weather has changed. “This song’s about a red brick wall, arrrgggghhhh!” Langford screams, all but spewing Guinness along with the words. And then it’s as if the band isn’t playing the song but chasing it. An exploding pattern of low guitar sparks makes a sound so hard you can almost touch it. Schlabowske is standing tall in the middle, telling his tale of woe–drunk in an alley, consumed by guilt, lost and abandoned, trussed up on a bed like a pig. That he sounds more corn-fed than James Stewart only makes the pictures his words draw in your head more ludicrous. And then he says something you don’t expect. Suddenly, the classic form of thousands and thousands of blues songs, where the setup of a repeated first line (”I can set right here look on Jackson Avenue/I can set right here look on Jackson Avenue”) is completed by a third line that feels inevitable as soon as you hear it (”I can see everything that my good woman do”) is turned inside out. Inevitable? “I built JFK a shrine”? What could follow that? The music rushes forward, but the song suspends itself; the break between the repeated first two lines and the third is filled with suspense. I’ve never heard anything like it–and that the third line, now the punch line, falls just short of the first is, somehow, absolutely right. “Red Brick Wall” isn’t the best song on Waco Express–it isn’t even close. It merely raises the stakes, to the point where Langford’s even faster, harsher, brutally bitter “Hell’s Roof” can take so much out of someone who just stumbled in for a good time, you might feel the band ought to pay the audience rather than the other way around. Schlabowske is back with the gorgeous, swirling motel-room ballad “If You Don’t Change Your Mind.” “Harm’s Way” is a happy-go-lucky stampede so bright and mindless (”Well, every time I think of my baby, working in that old coal mine/I feel so doggone guilty, I–”) you know nothing can go wrong. One song before the throwaway closer that lets the band off the stage to join everyone else at the bar, there is “Revolution Blues.” With big, dramatic flourishes, voices making cheesy horror-movie “woo-woo-woo’s,” the beat moving like a runaway stagecoach without a driver, Schubas Tavern falls away. It’s Neil Young’s song about the Manson family. When he sang it on On the Beach in 1974, the pace was slow, almost lazy, the voice laconic, a hipster’s knowing smile behind every line: “I’ll kill them in their cars.” As Langford races through the territory, half-scared, half out for blood, you catch that like a flash of light if you catch it at all. You feel the tension, all but scraping your skin. Something terrible is about to happen. No, it’s worse than that: Something terrible has already happened, and you’ve forgotten what it was. The song moves too fast, its words buried in its drive: The Waco Brothers aren’t going to tell you what happened, only that it did. A lot of good nights out don’t give you that much to take home, that much to keep you awake. This entry was posted on Saturday, January 17th, 2009 at 16:15 and is filed under Disc. You can follow any responses to this entry through the RSS 2.0 feed. You can leave a response, or trackback from your own site.